After returning to form, following a long string of critical and commercial failures, with the multi-personality thriller Split, writer/director M. Night Shyamalan created noticeable expectations with Glass, a sequel to both the 2016 hit and what is still his best film to date, the excellent Unbreakable. Unfortunately, what seemed like a surefire success instead turns into something far less engrossing and convincing, unable to weave all its admittedly fascinating elements together in memorable fashion. Set three weeks after the events in Split, we are introduced to a number of familiar characters. David Dunn (Bruce Willis) and his now adult son Joseph (Spencer Treat Clark, reprising his 2000 role), run a Philadelphia home security business, but behind the scenes team up to fight crime, with David donning his recognisable raincoat, while Joseph feeds his father with necessary information via headset communication. Known as The Overseer, David’s long-term vigilante efforts have attracted the attention of police, who are determined to find and arrest him. Elsewhere in the city, Kevin Crumb (James McAvoy), who obtained a dangerous 24th personality known as The Beast the last time we saw him, has again kidnapped a group of innocent teenage girls, but before his gruesome plan can be carried out, David arrives on the scene to save the day. A series of events will see David and Kevin placed in a Mental Institution, where they will be grilled by renowned psychiatrist Dr. Ellie Staple (Sarah Paulson), who believes that the pair’s superhero abilities are nothing but a state of mind. Just when things can’t get any more complicated, David is reunited with his arch nemesis Elijah Price, aka Mr. Glass (Samuel L. Jackson), who has been heavily sedated due to his frequent, nefarious schemes to escape the expansive facility he has been imprisoned in for the last nineteen years. While Casey (Anya Taylor-Joy), who escaped The Beast’s clutches but sees hope in bringing Kevin back to the ‘light’, and Joseph try to help their respective patients, the three unique individuals play off each other in ways that may affect the city’s entire population. 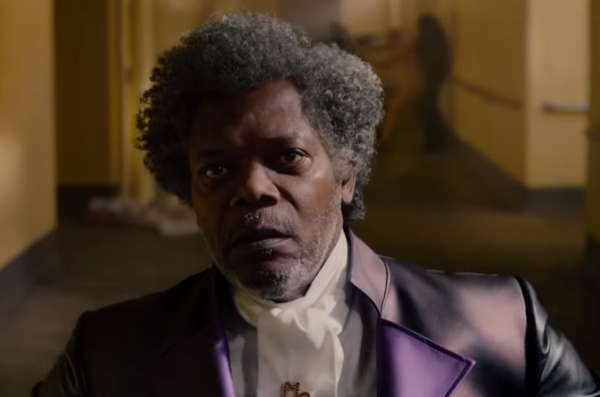 Glass begins quite well (despite an unimpressive cameo by the director, who crudely links his own historical connection between the three films), setting up its premise in a way which could be guided somewhere that’s fresh and different to the multitude of superhero flicks audiences are pummelled with these days. But it doesn’t take long for the seams to show, as Shyamalan becomes overly self-conscious about the superhero universe he clearly wants to construct, so much so that it all begins to verge on parody. Characters (especially Elijah) are forever spouting exposition about the foundation of superhero mythology, but where Unbreakable beautifully walked that fine line between the bold and the absurd, here he largely crashes into the latter, causing his material to feel clumsy and forced. Even the comic book-inspired look, superbly evoked in the 2000 blockbuster, is laboured on this occasion, keeping audiences all-too-aware of the moving parts that Shyamalan is attempting to organically connect. Not helping matters is the score by West Dylan Thordson (who did a far better job on Split), which too obviously imitates the work of Bernard Herrmann (Psycho, It’s Alive, Taxi Driver), detracting from rather than elevating the movie’s moody atmosphere. At the opposite end of the spectrum is the cinematography by Mike Groulakis (Split, It Follows, Under The Silver Lake), whose widescreen compositions do their best to bring the director’s ideas and themes to eye-catching life. Most of the performances deliver the goods. Willis, who has delivered a depressingly large amount of lifeless turns in recent years (including the awful Death Wish remake), thankfully shows interest here, and effectively underplays instead of just going through the motions. Clark also impresses as Joseph, and he and Willis work well together, generating some of the movie’s more humorous moments. McAvoy, as he did in Split, has a whale of a time as Kevin, showing considerable skill as he cleanly separates one personality from the other, and also offers up a couple of amusing confrontations. Jackson is fine, but is undermined by the clunky dialogue he frequently has to utter. Paulson (Bug, Mud, 12 Years A Slave, Bird Box) however cannot overcome a role which is illogical in the extreme. So much of the chaos which ensues arises from this supposedly intelligent person doing stupid things, and Staple is even more incomprehensible by the film’s end. Given Shyamalan’s track record as a film-maker, most movie-goers will be waiting for the big twist ending, but because of that very fact, a number of the revelations (but not all) are predictable, closing on a weak, deliberately vague final scene which, depending on the film’s success, could lead to numerous sequels, follow-ups, and spin-offs. Glass isn’t terrible, and is far from Shyamalan’s worst (The Happening still holds that mantle), but considering the immense promise that the concept held, has to be classed as a massive disappointment.